Comics based on licensed properties are like the Rodney Dangerfield of comic books. They seem to be the frequent target of certain outspoken comics publishers, and don't get as much respect or critical acclaim (notwithstanding the fact that people love comics such as those based on My Little Pony, Star Wars, and many others). But as you can see from this new limited series, in the hands of a talented creator like Tom Scioli, any premise can be made to work, creating a series that makes for an unlikely-but highly recommended-SPX Spotlight. I'd love to tell you that my very first comics were some groundbreaking Alan Moore book or some rare underground indie book that was a critical darling, but they weren't. The first comics I ever loved reading were Transformers and GI Joe (tied in with toys and TV shows) and Secret Wars (a story written to sell toys). But here's the thing - as an 8 year old, all I wanted were fun comics with cool action, and these comics delivered that in great measure. More importantly, they got me into reading (all sorts of) comics. 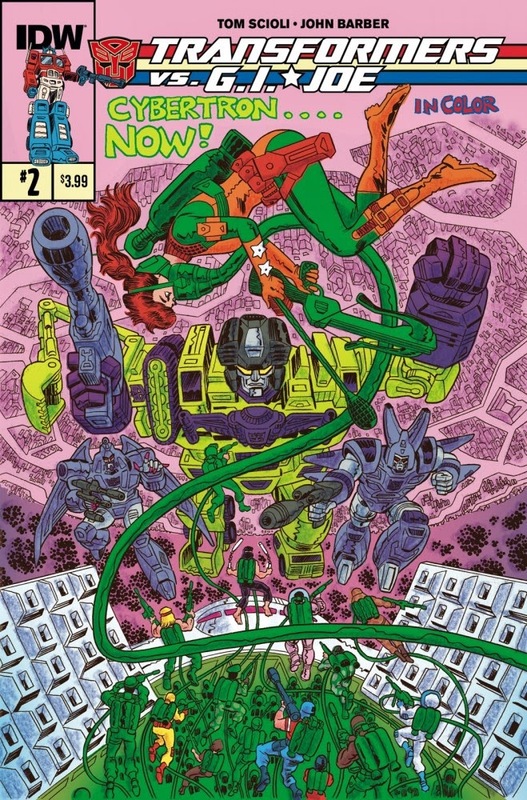 When I heard Tom Scioli was going to be working on a Transformers vs. GI Joe comic book, I knew I had to take a look. You (hopefully) know Scioli from his work on Gødland and American Barbarian. 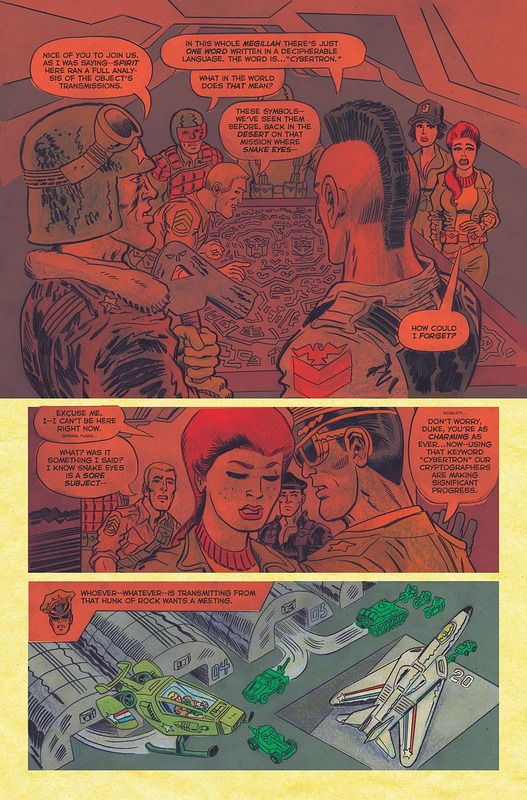 If not, know that Scioli is a master of Kirby/Starlin-style science fiction and superheroic craziness; Gødland is an homage to cosmic comics such as The Eternals or the Fourth World, and American Barbarian feels sort of like Kamandi crossed with Captain America, where the main villain has tanks (yes, actual tanks) for his feet. I wondered what it would be like for him to bring his unique design sensibility to licensed properties such as Transformers and GI Joe. I needn't have worried. Transformers vs. GI Joe (story by Scioli and John Barber, art by Scioli) is a gorgeous, intricately detailed, action-packed comic that has 8-year old me doing back-flips. There's an aspect of nostalgia here, but in just a few issues Scioli creates a unique aesthetic for this book which is completely engaging. The story starts with a #0 issue (from Free Comic Book Day) which is available on ComiXology. That issue begins with Decepticon Starscream (the one who was always trying to overthrow Megatron) chasing Bumblebee (the little cute one) from their home planet of Cybertron all the way to Earth. They land in the middle of a firefight between GI Joe and Cobra; during the course of that firefight the Cobra Commander (with the mirror mask) shoots Snake Eyes (badass ninja guy, never takes off his mask). 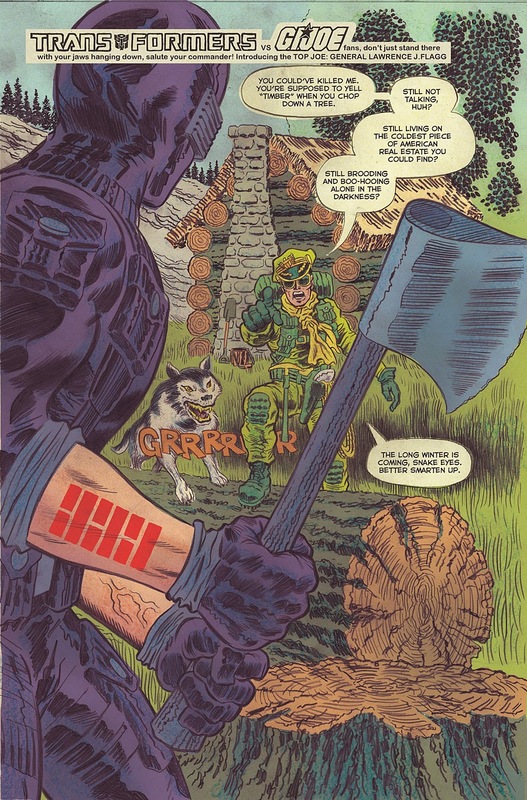 Issue #1 begins with General Flagg (one of the leaders of GI Joe, who feels like a character right out of Dr. Strangelove or Apocalypse Now) visiting Snake Eyes who has been living alone in the woods since he was injured in the fight with Cobra. The story then jumps to a (extremely entertaining) battle between the Joes and Cobra in the middle of downtown Springfield USA. The Cobra leaders make their escape and talk of their plans for the coming darkness. The Joes return to their secret base, where they discuss what appears to be an asteroid on a possible collision course with Earth. The object is transmitting its true name - Cybertron! The Joes remember their brief initial encounter with the robots, and plan to roll out the "welcome mat" to the invaders, and the story next moves to the top secret location known as "Area Zero" where the Joes have (without exactly knowing what they are) displayed the Autobot and Decpticon symbols. Three ships (who we know to be Soundwave, Shockwave and Starscream) land, and the Joes provide a friendly greeting but (not surprisingly) things go south quickly, as fighting ensues. Thankfully, GI Joe has a plan which involves a giant space laser (named the "Colton Bolt" after General Joe Colton, the legendary founder of GI Joe). 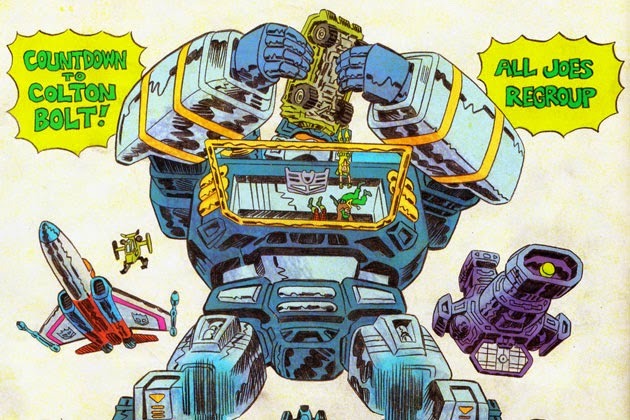 This helps them overcome the Decpticons, and by the end of the first issue a group of Joes make their way to Cybertron aboard their shuttle, to take the fight to the robots. Issue #2 begins with the Joes that have made it to Cybertron. They detonate "green bombs" that immediately cover the ancient Autobot capital of Iacon with plants. They then take the fight to Trypticon (which is, of course, the capital of the Decepticon empire and also transforms into a giant dinosaur), and engage the Decepticons in battle. They hold their own, even when the Constructicons show up and turn into Devastator (which some of us really wish we had had as a kid). 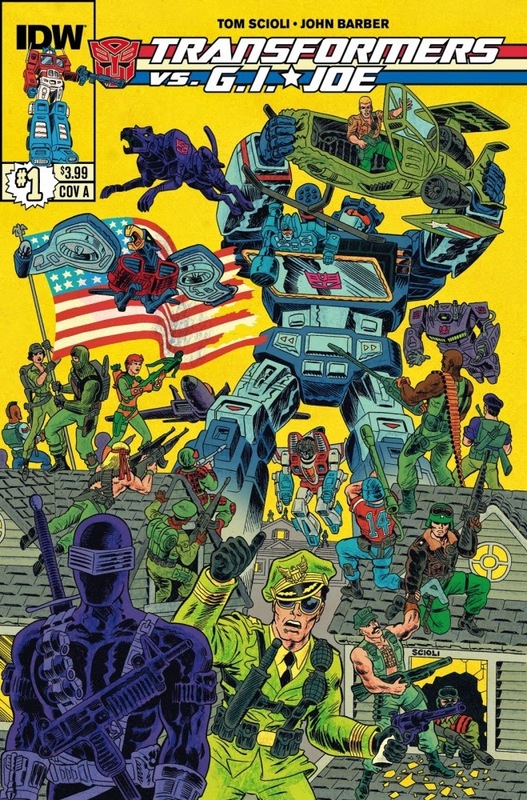 Some of the Joes are captured by the Decpticons but ultimately freed by clever deception by the Autobots (and taken as the Autobots' hostages, since from the Autobots' perspective they appear to be a hostile invading force), and the other Joes (who've set themselves up in now-grassy Iacon) snag themselves a prisoner of their own, the Autobot Wheeljack. In case you haven't guessed, this comic is an absolute blast. Barber and Scioli bring a lot of fun, silliness and humor to the story, while still respecting the source material. You can enjoy this book ironically or nostalgically, or you can appreciate it without any irony whatsoever. The story is straightforward - robots and humans meet, and combat, hijinks and misunderstandings ensue. 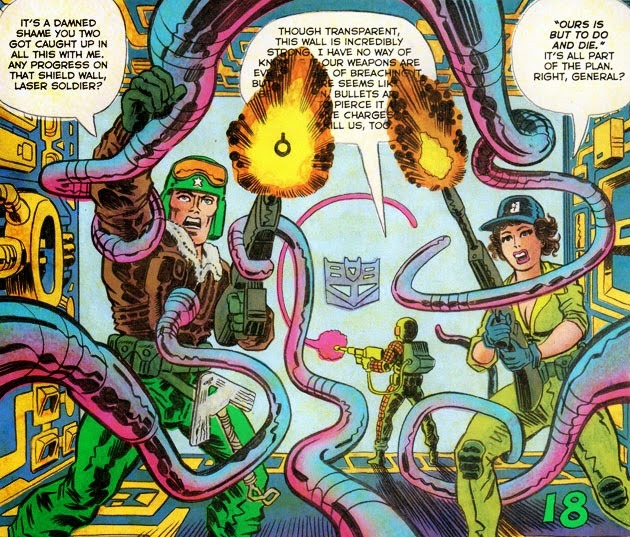 Also, rest assured, if you haven't read any other Transfomers or GI Joe comics, you'll be able to follow along, as this exists outside of regular continuity for either comic. There isn't a a great deal about any of the characters that you'll learn (this is not a deep psychologial exploration of the horrors of war), but the dialogue between and among all the characters is fun, engaging, and completely in keeping with the tone of the story. There are so many little and big things that that the creative team do here to make this an interesting reading experience. While the book is printed on glossy high quality paper, there's a weathered quality to the which makes this seem like more of an artifact (it might actually work well if printed on newsprint a la MindMGMT). The entire design of the book feels much more "indie" than is typical for a comic based on either of these properties, so credit is due to IDW for giving the creative team the flexibility to make this book look the way they want it to look. The art in this book is (and should be) a huge draw for any reader. Scioli does incredibly detailed work in this comic (each has his own distinctive style, but I'm reminded a little of the work of Ed Piskor and James Stokoe in addition to the Kirby and Starlin influences), and each page conveys dynamic action and motion, particularly in the second issue which is almost entirely chase and fight sequences. While less directly Kirby-inspired than his work on Gødland, there are still some similar elements such as use of the "Kirby crackle". The art has an overall stylized, retro look to it that is unlike most other books you'll read based on toys and cartoons; it's not specifically retro to the 80's, it just has this feeling like it's something you discovered from a long time ago. Scioli's line work is, unlike many other artists that have worked on these books, not attempting to be "realistic" or modern in its rendering. There are some pages where the Joes and the Transformers look (and are presumably intended to look) like action figures, and the line work, coloring and lettering all have a less-than-perfect, self-made quality to them which is surprising in the best possible way. For example, in one case the coloring of the words extends slightly outside the lines, but this works in that circumstance (a character gets shot) because it accentuates the shock of that character getting wounded. The letters here are genuinely delightful (and are really part of the art of the story), as there are number of big, colorful sequences that are there to punctuate an action sequence or a dramatic moment. The coloring is similarly thoughtful, as it's vivid, detailed and dynamic, but also feels "weathered". More generally, the book is filled with terrific details such as where each time you see a character for the first time, there's a graphic that looks like the back on an action figure box which provides some "fact" about that particular character like "Gung Ho: Beware His Spicy Cajun Gumbo" or "Wheeljack: Near-Infinite Curiosity". You hope that at some point they'll list the power levels of the character (strength, endurance, intelligence, etc.). The level of detail and thoughtfulness in this book makes it feel like a labor of love. Transformers vs. GI Joe is the ridiculously fun, terrifically illustrated, totally crazy robot vs. soldier book that was missing from your life. Give it a look.